15.0 Amps, AC/DC, 5,800 rpm High Strength, Aluminum Alloy Shoe Two Second Electric Brake Rear Pivot Depth of Cut Adjustment 100% Ball and Roller Bearings, Helical Gears 50 deg. Bevel Capacity 20.0 Amp AC/DC Switch Includes Carbide Blade and Angled Blade Wrench SPECIFICATIONS Amp Rating (120V AC/DC) 15.0 No-Load Speed (rpm) 5,800 Max. 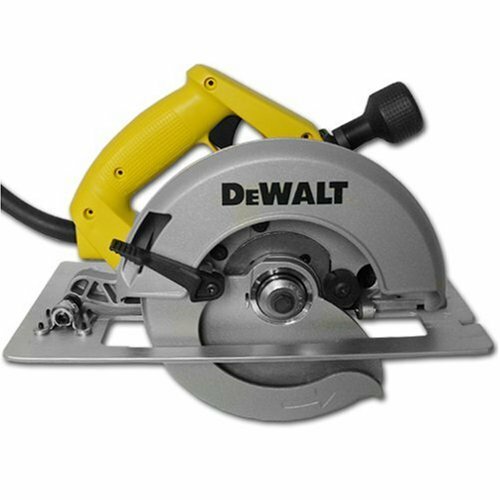 Power Output (Watts) 2,075 Blade Diameter 7 1/4" Max Depth Cut 90 deg. 2 7/16" Max Depth Cut 50 deg. 1 3/4" Max Depth Cut 45 deg. 1 7/8" Tool Weight 12.3 lbs. I have logged hundreds of hours with this saw in my hand and it never failed me. It cuts as strong now as it did when I first bought it - a good ten years ago. I previously had a couple of Craftsmans & and an old Skil but I just gave them away after getting this. I've used saws costing twice as much and I still prefer this old yellow friend. She is easy to hold, feels great in your hand and sold while cutting. Of the thousands and thousands of dollars I've spent on tools, this was the best $150 I ever spent. I usually spring for more money than I need, but I'm sure glad I didn't in this case. My youngest son just bought a house and is in need of some tools (not mine). He's getting one as a gift. I have owned this for about 9 years now and have had no issues. Plenty of power, fairly good balance and "feel", the base is wide enough to be stable, brake is good and depth adjustment is pretty good. Prior to this I have owned (and still do) a Black & Decker Sawcat and Super Sawcat. For my money and hundreds of hours on the job, the Super Sawcat was THE perfect circ saw. GREAT balance, plenty of power and good brake- also VERY wide baseplate- and LIGHT! Still have it and it's no longer in production as far as I know. Lots of pros in New England were using that in the 80's. Black & Decker sold out to DeWalt. I run finish blades on that puppy. I use this DW364 for framing and reno work. It's really pretty good but just does not have the balance that the Super Sawcat has. It is a bit tricky to have to "peek" over the adjustment housing to actually see the cut. Again, the SS was better, and the guide "notch" for cut guide reference is not ideal. At first it's easy to cut on the wrong side. Minor points. It's a good saw and definitely worth the money. Would be nice if it came with a rip fence. Almost nothing get's a five star rating in my book, (the Super Sawcat would have) but this is probably 4 1/2. I AM A PROFESSIONal contractor and this is a great saw with some nice features, 2nd one purchased, both are still in use. This is my second Dewalt saw, I sold the first when I moved. I like it because it is heavy and cuts straight. I tried the Makita, which is lighter, and also a good saw, but prefer the Dewalt. The new depth adjustment is as good as they say and right at your fingertips. I purchased this saw because I was building a 600 sq ft deck and really needed something that would work well. What a great investment this was. I can't begin to tell you how many pieces of wood we had to cut and the saw did it with ease. I am extremely happy with the results and very happy that I followed the reviews of others before I purchased the saw. Even after completing the deck, I still don't even have to change the blade. I also purchased the reciprocating saw from DeWalt which also worked great. You get what you pay for and it's worth every penny, especially when you don't have tax or delivery. the saw to get what I need. dewalt makes a good product and with the way things are I doubt that I would do better if I bought from some other company.